From high-profile CEOs and movie stars to healthcare and retail workers, men consistently make more than women. Social scientists and economists have found clear evidence that gender-based discrimination persists – and is so deeply ingrained in culture and practice that it often goes unrecognized. Ensuring that all employees have the right to discuss and ask about pay and job opportunities, and that anti-discrimination laws are effectively enforced, will benefit women, families, businesses, and our state economy. More than seventy years after Washington State banned paying women less for similar work, women’s pay still trails significantly behind men’s. Women make up almost half of the workforce and are either the sole or primary breadwinners in over 40% of families with children nationally. Yet, the typical Washington woman who worked full-time, year-round in 2013 took home only 80 cents for every $1.00 made by a man. On average, Washington women working full-time in 2013 were paid $18,000 less than men, diminishing family budgets and undercutting community business prosperity. Women of color face especially large wage disparities. Nationally, median pay for White women is 78% of White men’s, for Black women 64%, and Latinas 54%. The wage gap persists at all education levels and across occupations. 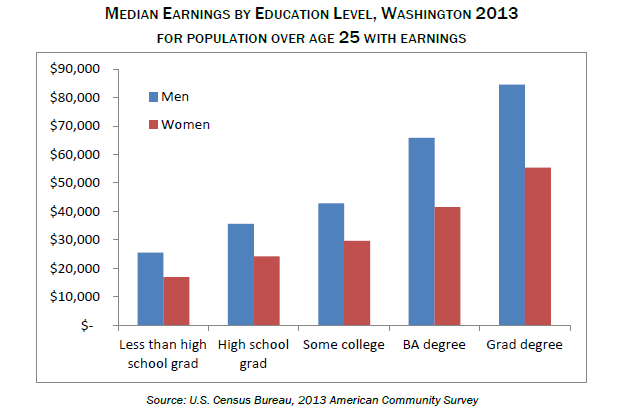 More women than men between the ages of 25 and 45 hold four-year college degrees in Washington, but women need those degrees to make the same amount of income as men with less formal schooling. Occupational segregation and devaluing “women’s work”: Continued occupational segregation and the lower value society assigns to “women’s work” explain a big part of the wage gap. Men hold 4 in 5 jobs in highly paid engineering and computer-related fields, and 3 in 4 jobs in aerospace manufacturing. Women predominate as health technicians, office administrators, and personal care services. Segregation persists and men’s jobs pay more within occupational categories. Men hold more retail sales jobs in hardware stores, while women predominate in clothing stores. In groceries, men dominate as meat cutters and make more than deli workers – who are mostly women. Time out for family care: Women are more likely than men to work part-time and to take time out of the workforce for family care responsibilities. 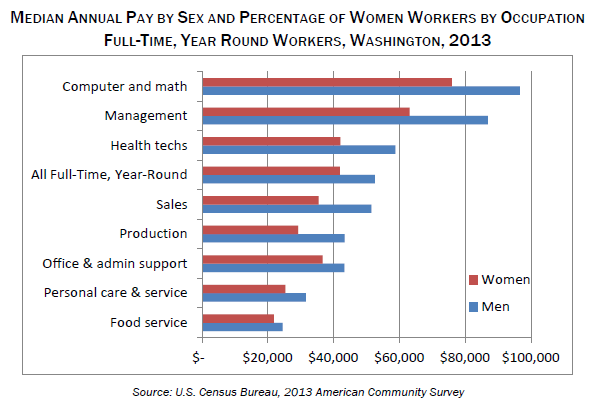 In Washington, women make up 47% of the full workforce, but hold only 41% of full-time, year-round jobs. The “wage gap” usually is calculated using only figures for full-time, year-round workers. If women scale back to make time for family for any part of their careers, they often lose even more in seniority, experience, opportunities for promotion – and lifetime pay. Motherhood penalty: Researchers have identified a “motherhood” penalty even for full-time employees resulting from employer preconceptions rather than from differences in experience or qualifications. Studies have shown that employers are less likely to hire women with children than either childless women or fathers, regardless of education and experience. On average, mothers tend to make lower wages than women without children, even after qualifications and hours worked are taken into account. A recent study done by economists at Harvard shows that women with MBA degrees who took 18 months leave to care for their infants earn 41% less than their male counterparts who took similar leaves. Women lawyers who took leave make 29% less, while the gap for female PhD’s is 33%. Discrimination: Up to 40% of the Wage Gap Remains ‘Unexplained’: Economists have found that up to 40% of the wage gap cannot be explained by differences in occupation, industry, union membership, education or experience. At least part of this “unexplained” wage gap is related to discrimination. Women are offered lower compensation than men when they are first hired, even if education and experience levels are similar, and they receive smaller and less frequent promotions. Washington State passed an Equal Pay Act in 1943 during World War II, when many women were performing traditionally male jobs. That law prohibits paying women less than men in similar work or in jobs formerly held by men. But to pursue a discrimination claim under this law, a woman would have to sue her employer in court and could only recover lost wages, not court costs or attorney fees. Both Washington State and the federal government have passed additional anti-discrimination laws that protect people in a number of categories, including gender, race, disability or veteran status. Under these laws, however, women must prove intentional discrimination. Courts have allowed employers wide latitude in justifying paying women less than men, including giving men and women different job titles for similar work. Employers may even claim there was no reason they paid a man more, but they did not intend to discriminate. Many women never find out they are being paid less due to pay secrecy. While salary information is usually openly available in public sector jobs, one third of private firms admit in national surveys to actively discouraging or prohibiting employees from discussing their pay with other employees. Among employees, over 60% of private sector workers reported in a 2010 survey that they were discouraged or prohibited from discussing pay. Protect the rights of all workers to discuss or ask about compensation, and prohibit retaliation against employees who do so. This will enable workers to find out if others in the company are being paid more for the same work. Protect the right of workers to ask why they are being paid less, or why they do not have the same access to job or career opportunities as others. Authorize the Department of Labor and Industries (L&I) to investigate charges of gender discrimination so that workers aren’t forced to go to court, and require employers to justify differences with job-related reasons, such as education, skills, or experience. Allow recovery of costs and punitive damages as well as lost wages if discrimination is found, either through an L&I investigation or court action, in order to discourage bad actors. Greater transparency in the workplace will provide everyone with more opportunity to gain equal wages. It will also open new career opportunities for more women and begin to challenge society’s general undervaluing of women’s work. Stronger fair pay legislation, together with more family-friendly workplace policies such as paid sick days, family and medical leave insurance, and reasonable accommodations for pregnant and breastfeeding women, will boost family budgets and women’s lifetime incomes. Local businesses will benefit, and our economy and communities will be stronger, when women have the opportunity to achieve equal pay.